From time to time people worry and feel anxious, often when they are stressed. They worry about decisions and things they have to do, and often do so to cope with the situation in a more efficient way. People with generalized anxiety disorder (GAD), however, have excessive, uncontrollable, and unrealistic worries about normal things most of the time. The way in which people with GAD feel worried and anxious does not help them cope with situations in a more efficient way, but rather can exasperate them. People with GAD can’t control their anxiety and worry. Often this results in expecting the worst even if there is no reason for it. As a result their anxiety is out of proportion to the risk and they have difficulty concentrating on other tasks. In the United States between 4.1% and 5.1% of people will have generalized anxiety disorder once in their lives. In the Netherlands this is 2.3%. It is likely that GAD is more common, but professionals often attribute the symptoms to a different disorder, or don’t diagnose it at all. Generalized anxiety disorder develops slowly: people worry a little more than usual and this gradually becomes worse to a point where people worry about something all the time. Worrying about daily things gives people with GAD the idea that they are in control of the situation. By going over every possible scenario they think they can eliminate all the risk factors. 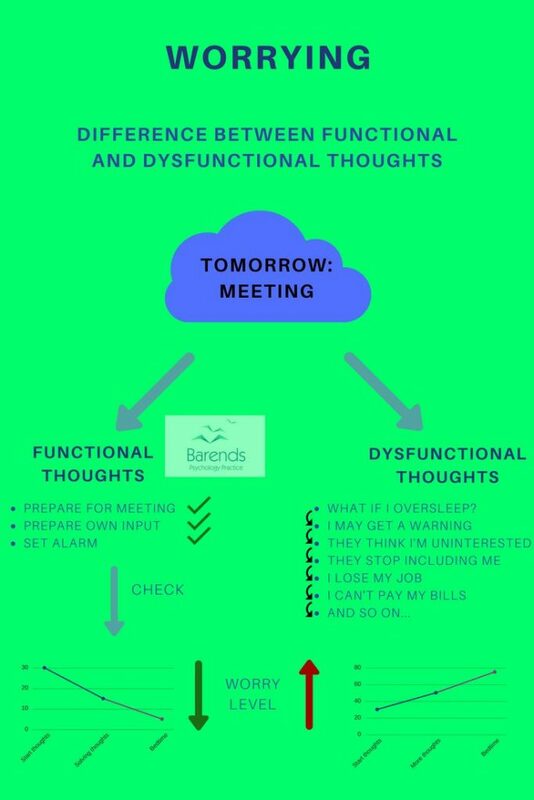 For functional thoughts it helps to ‘worry’ about them for a while, because they help you solve the issues and the person can take care of them, as can be seen in the image on the right (or above). For dysfunctional thoughts, however, this is not the case. Dysfunctional thoughts are thoughts concerning a situation with an uncertain outcome. If the outcome is uncertain, there could be multiple outcomes and someone with GAD will need to think of all the possible outcomes. As can be seen in the image, each thought leads to another (more worrisome) thought. In this example the person worries that oversleeping eventually leads to losing their job. The worry levels gradually increase as the person worries about these thoughts. These thoughts are called dysfunctional, because one cannot solve the issue and therefore create more possible scenarios and thus also more doom scenarios. More doom scenarios means more worrying in order to give the person with GAD the feelingt that they are in control of the situation. For a brief moment the worrying reduces the anxiety people experience, thus worrying seems to be rewarding. Unfortunately, this is not the case. Subconsciously people with generalized anxiety disorder teach themselves that worrying gives them a sense of control over the situation, and that being ‘out of control’ (not worrying) increases anxiety. In other words, they’ve created a vicious circle in which they get stuck. Excessive and persistent worrying about concerns (big or small) that are out of proportion to the impact of the event. Inability to relax. Feeling restless all the time. Difficulty/inability to handle uncertainty or indecisiveness. Always thinking of possible negative outcome when it comes to possible scenarios. Inability to relax; feeling restless all the time. Ladouceur, R., Gosselin, P., & Dugas, M. J., 2000. 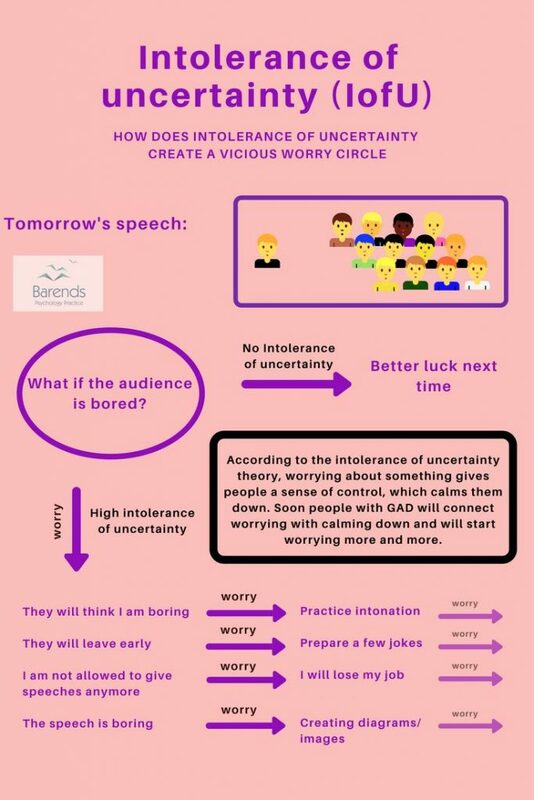 Experimental manipulation of intolerance of uncertainty: a study of a theoretical model of worry.Behaviour Research and Therapy , 38, 933-941. Bijl, R. V., van Zessen, G,m & Ravelli, A., 1997. Psychiatric morbidity among adults in The Netherlands: the NEMESIS-Study. II. Prevalence of psychiatric disorders. Netherlands Mental Health Survey and Incidence Study. Nederlands Tijdschrift Geneeskunde, 141, 2453-2460. Grant B. F., et al., 2005. Prevalence, correlates, co-morbidity, and comparative disability of DSM-IV generalized anxiety disorder in the USA: results from the National Epidemiologic Survey on Alcohol and Related Conditions. Psychological Medicine, 35, 1747-1759.